The creamy texture of butter beans combines perfectly with sweet baby plum tomatoes. Serve them on top of warmed ciabatta for a simple, comforting supper. Preheat the oven to 220°C, gas mark 7. 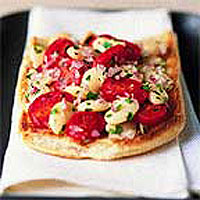 Spread out the tomatoes in a single layer on a large baking sheet. Drizzle with the olive oil and season with ½ tsp salt and black pepper to taste. Split open the ciabatta horizontally, then cut each half widthways into 2 even-sized pieces. Place the ciabatta on a separate baking sheet, cut-side up. Place the tomatoes and the ciabatta in the oven and cook for about 8-10 minutes, or until the tomatoes have softened and the ciabatta is warm and golden. Meanwhile, toss the butter beans, red onion, garlic and parsley in a large bowl. Divide the warm ciabatta between 4 plates. Stir the roasted tomatoes into the butter bean mixture, then pile onto the bread. Serve warm.